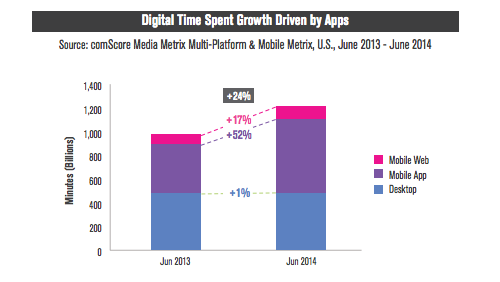 A few months ago, comScore published the 2014 edition of its U.S. mobile app report. It’s full of information verified by gigantic sample sizes of data, processed by one of the largest digital analytics and research companies in the world. For example, did you know that the amount of time we spend using mobile apps has increased over 50% in the past 12 months? 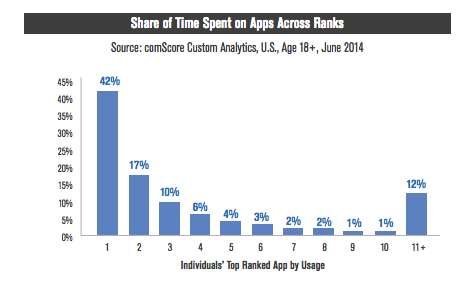 42% of that time is dedicated solely to your most popular app. Can you take a guess what that may be? Facebook is the #1 app in both audience size and share of time spent among each of the different demographic segments broken out, highlighting the breadth and depth of its popularity and importance to the mobile media landscape. It’s not a surprise that Facebook is the most popular app on mobile devices, but it was surprising to see there wasn’t one game on the full top 25 list. 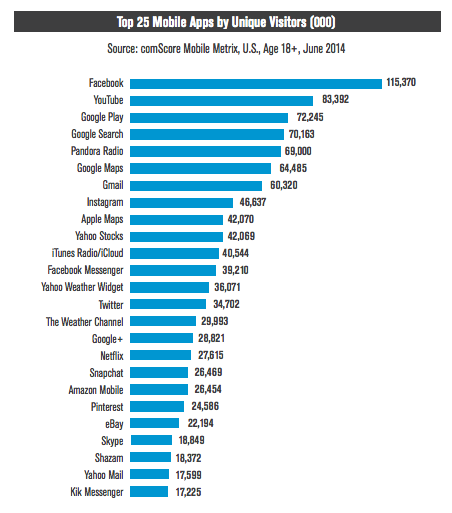 Here is how everyone in the United States above the age of 18 is spending their time on mobile devices. Now that you’ve seen the list, we want to ask you a question. What do all 25 of these mobile apps have in common? They’re all free to download, but not free to use. That’s what we noticed while thinking about that list. We aren’t referring to the monthly membership fees that come with a Netflix account or the eventual spending that comes along with Amazon Mobile. Every one of these apps is completely functionless and unusable without accessing and consuming mobile data. Many of the best iPhone games are completely free, or have a small upfront cost, but none of them have any barrier to playability for future use. Despite that, none of them crack the top 25 most used apps. In an age where unlimited data plans are an endangered species on the verge of extinction, our collective reliance on data is directly correlated to our favorite ways of spending time on our phones. When you think about the inconveniences and frustrations we have while on the subway, on the move, or at a crowded event, it stems from the anxiety of being disconnected from these apps that play such instrumental roles in our daily routine. Airplane mode? Don’t even get us started. But every minute spent tweeting, snapping, watching, Instagramming and Googling is also a minute spent spending; burning precious data that comes with a price tag per megabyte. With that in mind, our marketing manager recently spent 28 days going on a “data diet“, trying to use WiFi as often as possible in place of his data plan. 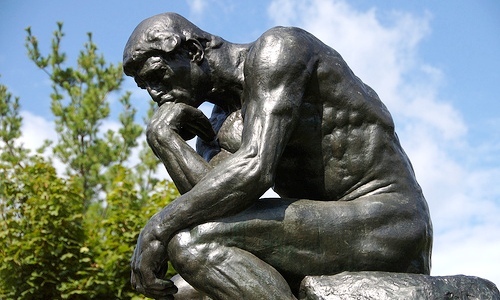 Part of that was because we challenged him to do it, part of it was just the intellectual curiosity of seeing how the idea would play out from conception to execution. For the previous 11 months, he averaged over 1.8GB of data used (and purchased) from AT&T without consciously connecting to WiFi whenever he wanted to use an app too. 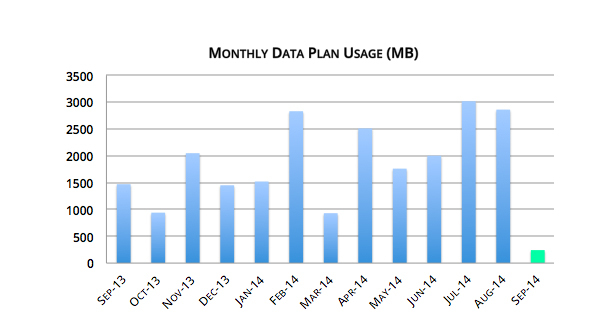 During a 28 day stretch between September and October, he used just 241MB on his newly purchased Verizon plan while still using his phone…all the time. With a little effort, a bit of data consciousness and the growing availability of free WiFi around businesses and venues around New York, he was able to offload 87.5% of his data last month onto WiFi networks. According to Greg Seibert, the CFO of Cablevision, his customers save about $30/month on their cell phone bills by being able to access data over the Cablevision WiFi network. Our marketing manager saved $60 last month using a similar strategy, placing on emphasis on guest WiFi networks in his favorite businesses and venues rather than the Cablevision network. We’re not saying you should use your phone less, or cut down on your favorite apps. We’re just saying you shouldn’t have to pay so much to enjoy them! How much money can you save by connecting to WiFi? Try it for yourself and find out. In our experience, over 65% of the businesses and venues you visit will have a network you can connect to. If you happen to go somewhere that doesn’t offer free WiFi, let us know.